he team at the Family Birthing Center at Yavapai Regional Medical Center (YRMC), Prescott Valley, is fond of saying they deliver memories. Prescott Valley residents Jocelyn and Brian Bucholtz agree. They’ve stored up happy memories from their two experiences at the Family Birthing Center: the birth of daughter, Brooklyn, who is now five years old, and the birth of their son, Cooper, who is now two. In fact, it was “awesome,” according to Jocelyn and Brian. 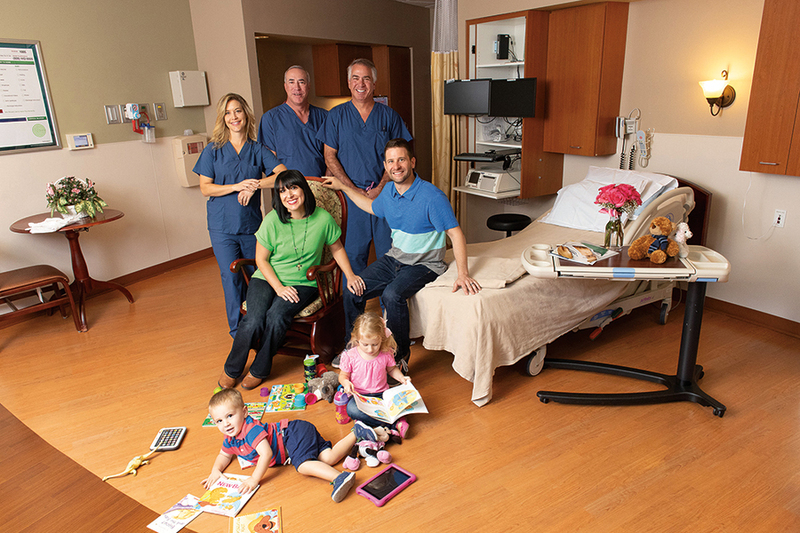 The couple’s experience with YRMC’s Family Birthing Center began long before Brooklyn or Cooper took their first breaths, or produced their first, boisterous cries. After research and conversations with friends, Jocelyn and Brian selected YRMC’s Family Birthing Center and Women’s Medical Care, PC, as their providers. Adam Feingold, MD, FACOG, of Women’s Medical Care, was Jocelyn’s obstetrician. With offices in Prescott and Prescott Valley, the Women’s Medical Care team also includes Luis Fernandez, MD, FACOG – who delivered both Brooklyn and Cooper – and Mary Hogan, MD, FACOG. The couple also tapped many of the resources available at the Family Birthing Center. They attended Family Birth Classes together and Jocelyn joined a breastfeeding class led by YRMC’s lactation consultant. A woman’s birth plan typically evolves during pregnancy. Most include, for example, who will be in the room during delivery and how the woman intends to manage pain. While prenatal visits include important health checks for mom and baby, Dr. Fernandez also makes sure there’s time to discuss birth plans, ask questions, and even express fears. That same support group is welcome at YRMC’s Family Birthing Center during labor and delivery. It’s this open and caring attitude – coupled with experienced nurses, excellent physicians and exceptional healthcare services – that distinguishes YRMC’s Family Birthing Center. Another benefit is the Family Birthing Center’s Level II Continuing Care Nursery. The Center’s perinatal services – care provided to moms and babies – is licensed by the Arizona Department of Health Services and certified through the Arizona Perinatal Trust. This allows the Family Birthing Center to care for high-risk moms and their babies at 32 weeks and greater. Jocelyn and Brian were relieved their children arrived without any complications. “I feel privileged that the Family Birthing Center is right here in our community and our babies were delivered there,” Jocelyn said. Another beautiful memory to cherish, thanks to the Family Birthing Center at YRMC.